The Telangana State Public Service Commission (TSPSC) has published the advertisement to fill the 281 Junior Lecturer vacancies in TS Govt Gurukula Junior Colleges. Job seekers who are looking for govt jobs can apply for the TSPSC Junior Lecturer Recruitment 2018. Contestants should have completed Graduate/ Degree with 50% aggregate in concerned subjects or BE, BA. B.Ed/B.Sc., B.Ed., or its equal qualification in any Government approved University for applying TS Junior Lecturer Recruitment 2018. Applicant should have minimum age 21 years and maximum age limit should not exceed 44 years as on the last date of application submission. Age relaxation will be applicable for reserved category candidates. Interested and eligible candidates are advised to apply TS Gurukula Junior Lecturer Jobs 2018 through online mode only. The TSPSC organization is inviting the applications from 09th August 2018 to 08th September 2018. Aspirants check out the whole article to grab more information regarding this post like educational qualification, age limit, selection process, application fee, pay scale, how to apply, important dates etc. Applicants visit the official website to get clear details about TSPSC Junior Lecturer (JL) Notification 2018. The TSPSC Junior Lecturer Jobs Apply Online link active soon. So, all the interested job seekers can fill the application form before the deadline. The organization will conduct the TSPSC JL Recruitment 2018 Preliminary Exam, Mains Exam, and Document verification rounds. Aspirants prepare well for the exam to get merit marks in the test. The TS JL Notification 2018 Examination consists of objective type multiple choice questions only. Paper-I questions are asked from General Studies & General Abilities and Paper II contain Streamwise Subjects (Degree level). Each paper consists of 150 questions of 150 marks with time duration of 150 minutes. Each question carries 1 mark. Total marks of the written examination are 300 marks. Applicants visit the official website tspsc.gov.in for detailed information about TS JL Jobs 2018 Exam Syllabus, Pattern. The TSPSC Selection Board will select the applicants for TS Jr Lecturer Recruitment 2018 on the basis of their performance in the written test, personal interview, and documents verification. Selected candidates will get the salary as per organization norms. Therefore job finders use this opportunity by applying TS Gurukula Junior College Lecturer Notification 2018 Candidates can apply for TSPSC Gurukul JL Jobs 2018 by using the direct link which is provided below. Here we mentioned simple steps to fill the online application form. For more latest updates applicants keep contact with this site. Refer the official website for full details about TSPSC Jr Lecturer (JL) Recruitment 2018. Education Qualification: Job Applicants should have completed Graduate/ Degree with 50% aggregate in concerned subjects or BE, BA. B.Ed/B.Sc., B.Ed., or its equal qualification in any Government approved University. Age Limit: Applicant should have minimum age 21 years and maximum age limit should not exceed 44 years as on the last date of application submission. Age relaxation will be applicable for reserved category candidates. Application Fee: Refer the official notification to know category wise application fee details. The Telangana Govt Junior College Lecturer Examination consists of objective type multiple choice questions only. The Examination will be conducted in 3-Papers. The Paper-I questions are asked from General Studies & General Abilities for 100 Marks and Paper II& Paper III contain Main Subjects streamwise Questions. Each paper consists of 100 questions of 100 marks with a time duration of 100 minutes. Each question carries 1 mark. Total marks of the written examination are 300 marks. Applicants visit the official website tspsc.gov.in for detailed information about TS JL Exam Syllabus, Pattern 2018. Job Applicants open the Official website. Download the Official TSPSC JL Recruitment 2018 Notification and refer clearly. 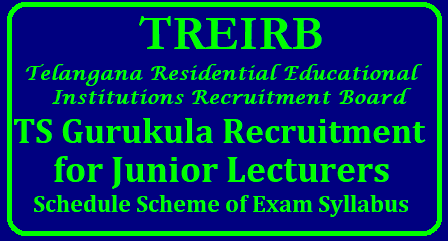 Then Open the TS Junior Lecturer Jobs 2018 Online Application form and fill with the required details. Upload required documents and submit. Pay the Application fee in online Gateway as given before the last date. Take Print out the TS Junior Lecturer Notification 2018 Application form for future usage.